Harold “Prince Hal” Patterson was a perennial all-star during his 14 year career. During the mid-1950s Patterson and fellow Hall of Fame member Sam Etcheverry were a powerful duo for the Montreal Alouettes. On september 22, 1956 they combined for a 109 yard passing play, the longest possible in Canadian Football. 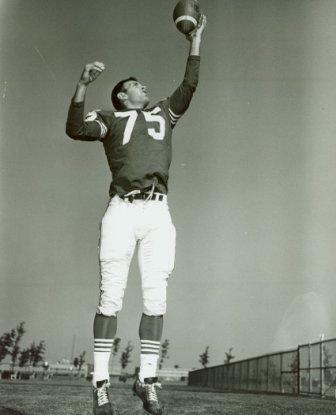 Patterson was the Eastern Scoring Leader in 1957, and during his stellar career, scored 75 touchdowns. He caught 460 passes for 9,473 yards and an incredible 20.6 yard average. Patterson was the league leader in pass receptions in 1956, and tied for this record in 1960.